THE RESULTS FROM LAST WEEK’S TEST ARE IN, and Jon and I are now 2nd Kyu! That puts us just three tests away from black belt. 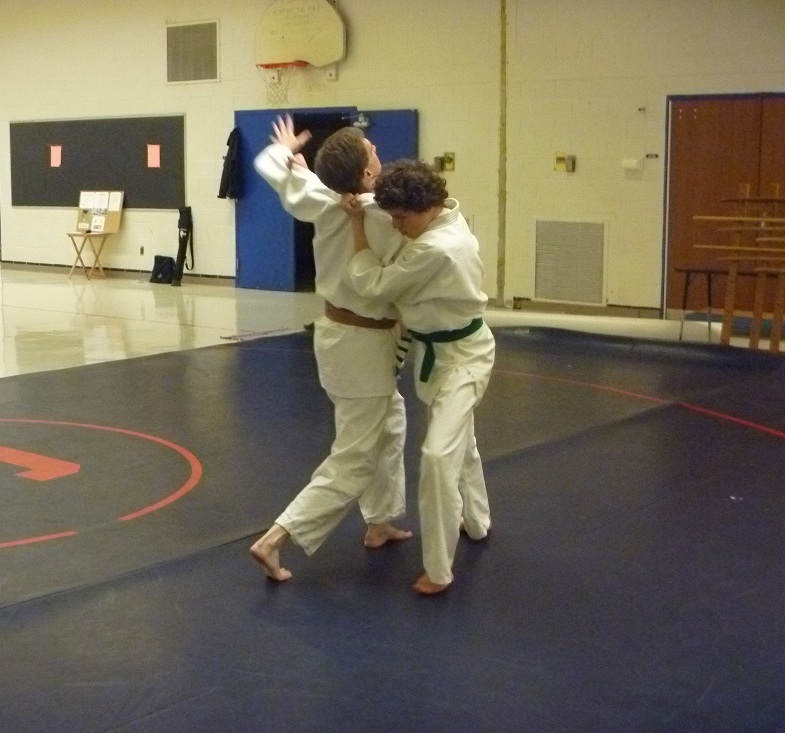 (For an illustration of where 2nd Kyu is in our school’s rankings, see my Aikido page.) We’d made a last-minute decision to test; Jon because he’d just recently achieved the previous rank, while I hadn’t had the time to focus on testing, due to other goals. But we’d both decided it was worth trying for, and I’d taken it as a good sign when I told Sensei that I would test and he didn’t wince. In the spirit of moving forward (in Aikido, both a principle of technique and a philosophy) we worked on form improvement tonight, in particular on how Shite should clearly lead Uke. I got a great example of the difference between just doing a technique and really leading it last week at the main dojo. A senior black belt was helping us prepare for our test, and when he was Shite, I felt basically at his mercy. He wasn’t using strength; instead, his balance and coordination ensured that I went where he led me. And I didn’t have to “go along” with the final throw – my launch was the inevitable outcome of what led up to it. 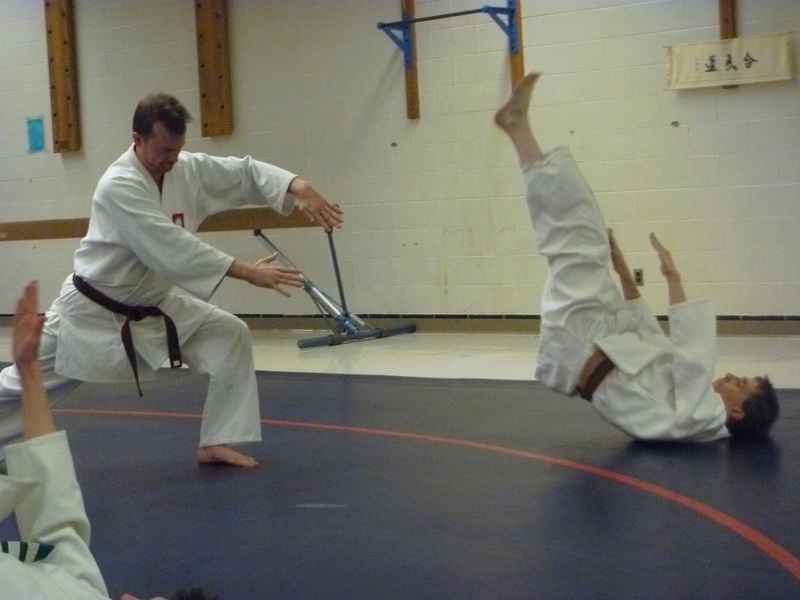 I got a real glimpse of how Aikido can work in a practical sense if necessary. Getting set for a step-in throw. This was our final class of the year, and thankfully Sensei did not celebrate it by making it a conditioning class. My legs are tired from the additional running I’m doing this month, so breakfalls were a bit challenging. But by the end of class I was feeling much better, as usually happens. 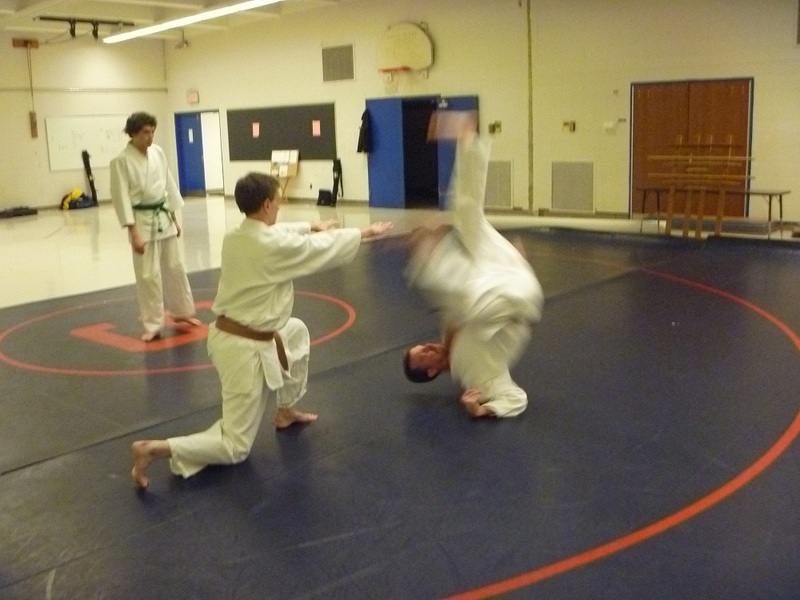 These photos are from tonight’s class (Thursday), courtesy of our instructor. Jon and I are the two brown belts. The third student is Isaac, who passed his pre-5thKyu test. Congrats again, Jon and Isaac!